Avoiding future adverse effects on human health from exposure to contaminants requires an overall strategy that integrates policies and measures to reduce use and releases of contaminants. Fish and marine mammals are major contributors to dietary exposure to contaminants in the Arctic. In other areas of Europe, fish and shellfish consumption is an important route of exposure. Human exposure to environmental pollutants occurs via the air, water and not the least, via the food we eat. How much pollutant one is exposed to depend on factors such as where we live and our habits. Seafood and fish from high up in the food web is an important exposure route for many contaminants. If environmental pollutants will give negative effects and what those effects would depend on the exposure route and the properties of the pollutant. The potency of environmental pollutants differs widely and while one pollutant may give effect already at very low concentrations, others need to accumulate and maybe be transformed in the human body quite extensively before any effect may occur. AMAP human health reports provide the baseline information on the health status of the populations living in the circumpolar area. Within the AMAP area, ten key areas have been identified that are a special focus for coordinated and harmonized monitoring and research activities. The main AMAP areas are: Chukotka Peninsula; the Mouth of Lena River; Taymir Peninsula, Norilsk area; Novaya Zemlya, Kara and Pechora Seas, the Mouth of Pechora River area; Kola Peninsula and Northern Fennoscandia area; Svalbard and East Greenland area; Baffin Island, West Greenland area; Canadian Arctic Islands and Arctic Archipelago; Lower Mackenzie River and Delta area; and Northern Alaska, North Slope area, see figure below. 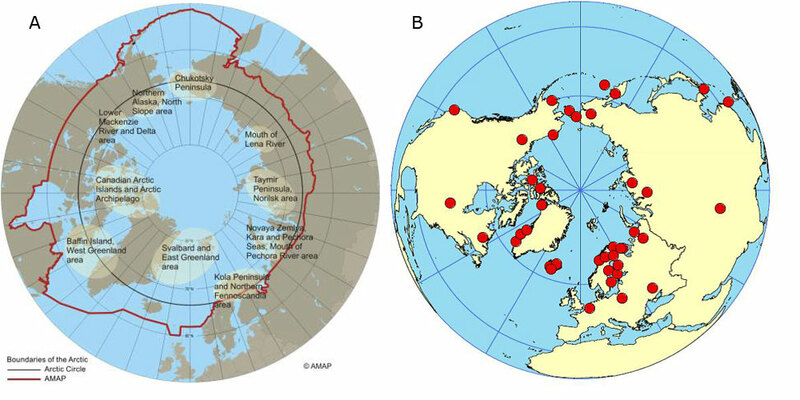 A) The AMAP boundary of the Arctic (red line). The map shows ten key areas important to the AMAP monitoring program. B) Example of study sites from which data have been entered into the ArcRisk meta Database. The majority of the places are AMAP monitoring program sites (AMAP). The work conducted within the ArcRisk project was focused on Europe and the European Arctic. Cohorts from the following areas in Europe were included in the ArcRisk: Croatia, Czech Republic, Finland, Greece, Greenland, Italy, Norway, Spain, Slovenia, and Russia. The areas were chosen to represent different climate zones, diets and exposure. Scenario analyses of contamination in human populations due to environmental exposure and the fate of contamination are feasible only in areas where the population is monitored systematically for years. Within the AMAP area, human population contamination exposure has been monitored since 1992 with a varying number of follow-ups. The longest time series, e.g., contaminant concentrations in pregnant Inuit women from Nunavik, Quebec, Canada, allow toxicokinetic modelling at reasonable accuracy when the contaminant intake is known (AMAP, 2009).